Usually when we see a device pop up on the homepage of various Internet deals sites, we expect to see either old or refurbished devices going for too much money. 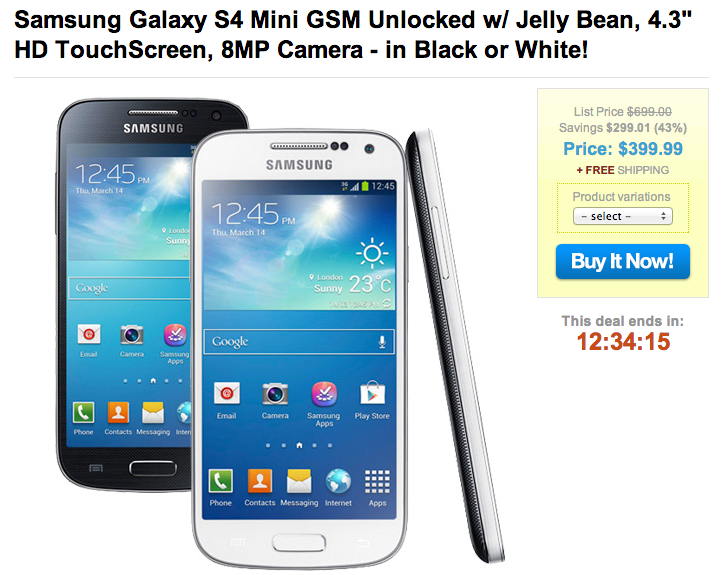 Today’s deal actually doesn’t seem all that bad, as 1 Sale A Day is asking for just $400 for a brand new (in retail packaging) Galaxy S4 Mini from Samsung. Usually listed in the excess of $500 ballpark, a cool $100+ off isn’t bad at all. It is the International GSM unlocked variant, meaning you will be able to pick up on either some AT&T or T-Mobile coverage, but you won’t be seeing any 4G LTE on either carrier. HSPA+ will be seen on AT&T just fine, but T-Mobile’s HSPA coverage will be seen less, as the band that is supported is currently being refarmed. So if you were thinking about picking one up for working here in the States, keep that in mind. The Galaxy S4 Mini is no top tier superphone, but it’s perfect for some users. It features a 4.3″ HD display, a dual-core Snapdragon 400 processor, Android 4.2.2, an 8MP camera and the full list of Samsung’s proprietary software hotness.